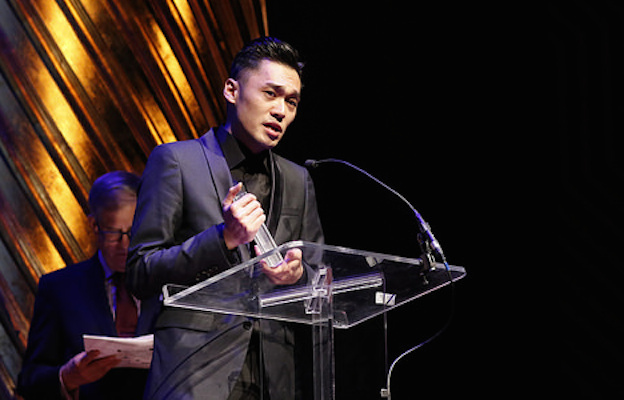 Nicholas Wong accepts the Lambda Literary Award for his collection of gay poetry, “Crevasse,” published by Kaya Press. Photo: Lambda Literary | Flickr. Kate Clinton, writer, activist, and comedian, had the pleasure of announcing the winners of the 28th Annual Lambda Literary Awards at NY University Skirball Center for the Performing Arts on June 6th. There were over 500 guests at the event celebrating the creativity and great work being done by LGBT authors. It was Clinton’s fifth year as master of ceremonies for this gala. She was joined on stage by Tavi Gevinson, a Broadway actress and editor, who introduced New Yorker Writer and author of “White Girls,” Hilton Als. He was awarded the Trustee Award for Excellence in Literature. “Powerful feelings rise up in me as I stand before you. Other people are my art,” he said. Poet Eileen Myles won the Lambda Pioneer Award and was introduced by Native poet Natalie Diaz. “It amazes that it has taken this long for the country and arts to recognize what I have known all along. That Eileen is amazing. She mad a space four us,” said Diaz. Nicholas Wong author of “Crevasse” and Carl Phillips, author of “Reconnaissance,” were winners in the gay poetry category. Wong encouraged attendees to start reading Asian poets. After thoughtful, serious, and full consideration, Lambda Literary has rescinded the nomination of Galileo’s Middle Finger: Heretics, Activists, and the Search for Justice in Science from the LGBT Nonfiction category of the 2016 Lammys. Lambda Literary will strive to improve the nomination process and work to maintain the highest standards in the awards nominations, recognizing literature that contributes to the preservation and affirmation of LGBTQ culture, and which honors LGBTQ lives.